Along with much of the corporate news media, the New York Times' coverage of the 2016 presidential election came up critically short when it came to shedding light on the darkest aspects of the Donald Trump campaign. Now, it appears that the paper is finally owning up to this journalistic failure — albeit a little too late for this election cycle. It has long been clear that the corporate media did a disastrous job covering the presidential election. 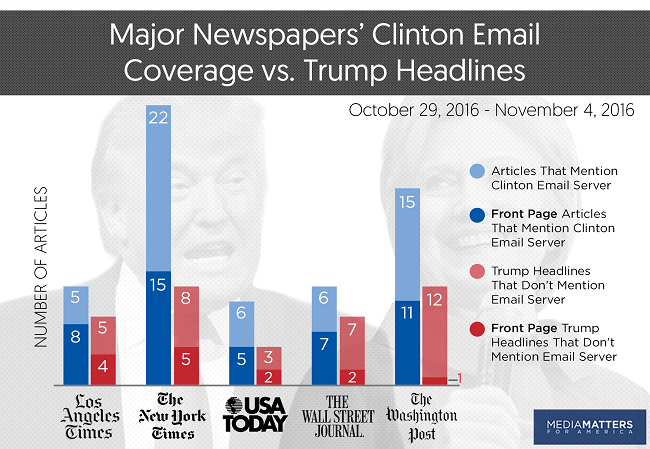 And despite a reputation as the "paper of record," the New York Times was one outlet that exemplified this journalistic malpractice, particularly in their wildly unbalanced coverage of the main stories dogging each candidate. The Times' coverage of Donald Trump's unprecedented ties to the government of Russian President Vladimir Putin was appallingly scant and lacking in urgency, especially when juxtaposed with their outsize contributions to the 600 straight days of Clinton email coverage. In fact, the Times actually ran a story implying that the FBI did not believe there was a "clear link" between Trump and Russia — despite the fact that it was already public news that Trump's advisory team had actually met with Kremlin officials, and despite the fact that higher-ups in the government knew for months that Trump was getting help from Russia. But was that the right decision? Was there a way to write about some of these allegations using sound journalistic principles but still surfacing the investigation and important leads? Eventually, The Times did just that, but only after other news outlets had gone first. I have spoken privately with several journalists involved in the reporting last fall, and I believe a strong case can be made that The Times was too timid in its decisions not to publish the material it had. If The Times didn’t write about ongoing investigations, it wouldn’t have produced the excellent scoop on Trump associates and Russia that broke Thursday night. Nor would it have so relentlessly documented the F.B.I.’s pursuit of Hillary Clinton’s emails until all facts were resolved. That investigation was fair game, and so was Trump’s. But it’s hard not to wonder what impact such information might have had on voters still evaluating the candidates, an issue I chided The Times for not pursuing enough in an earlier column. Would more sources have come forward? Would we already know the essential facts? It is indeed hard not to wonder — and we should not have to wonder. With Trump in charge of the machinery of government, it is essential that we have a Fourth Estate willing to ask tough questions, ruffle a few feathers, and stand their journalistic ground. We must hope that this regretful tone from the Times is progress towards regaining the independent, fearless press we deserve — and will absolutely need in the Trump era.